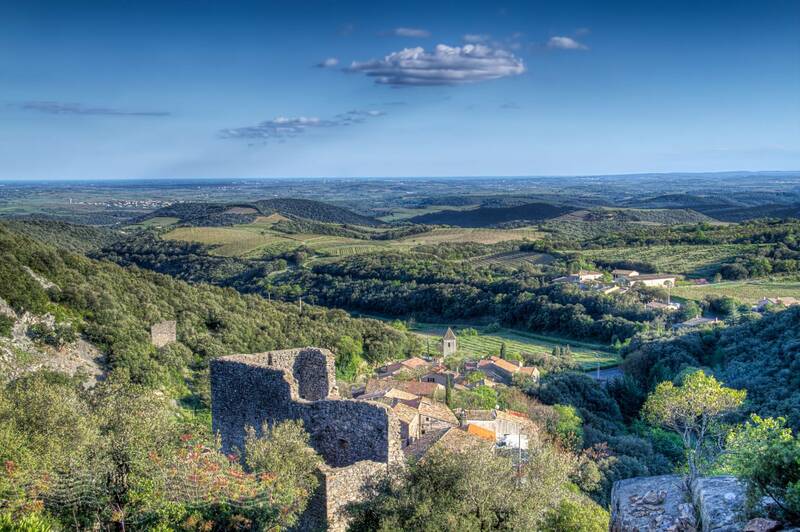 We’re visiting the small village of Cabrerolles situated on the edge of the escarpment that makes the Massif Central. The village has commanding views across the plains towards the Mediterranean sea in the distance. In previous posts we have climbed up the cobbled streets through the village and on up towards the chateau or castle. Then through the inner gate, we got a glimpse of the promised views. Climbing on up, we finally come out onto a rocky outcrop. Clinging to the side of this rocky pinnacle sits the castle with commanding views over the plain before it and the Mediterranean sea in the distance. Now, we can imagine why, in Medieval times, the villagers would have wanted to build a fortress here. With marauders regularly raiding in over the Pyrenees, you would need plenty of notice to get people back into the town and slam the gates shut in good time!